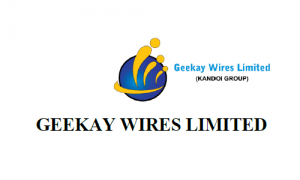 Geekay Wires has been in the business of manufacturing high quality galvanized steel wires and wire products and has been meeting the requirement of various clients in the government and private sectors like power, construction, automobile, general engineering and domestic segments. The company was taken over by the Kandoi Family in 2012 and it has over the recent past ramped up production capacities. Today; the company is an ISO 9001: 2008 certified, manufacturer, exporter and supplier of the superlative wires and cables like galvanized wire, earth wire, stay wire, ACSR steel core, cable armoured wire, guy strand, barbed wire, spring steel wire, patented wire, detonator wire, and spring steel wire, nails and fasteners etc. With robust infrastructure & testing facilities, it is in the preferred-vendor list of PGCIL and in many State Transmission & Distribution Companies, electrical contractors, corporate engaged in turnkey business of creating infrastructure for power transmission & distribution, cable & conductor manufacturing, etc. In FY 2016-17, installed capacity in its Unit I was 18,000 MTS p.a. It has recently completed an expansion project at Unit I as well as has set up a ‘nails’ manufacturing unit (“Unit II”) and hence its current aggregate installed capacity is 30,000 MTS p.a. (24,000 MTS p.a. for Unit I and 6,000 MTS p.a. for Unit II). Further, it plans to increase the capacity of Unit I to 36,000 MTS p.a. and of Unit II to 15,000 MTS p.a. by the end of 2019-20. Geekay Wires IPO allotment status is now available on Bigshare Services' website. Click on this link to get allotment status. Too early sir. Markets are making new highs.